I'm currently working on a new project for Orchard Books. It's a story written by Jonathan Emmet and is the second story I will have illustrated of Jonathan's. The first, 'Pigs Might Fly' was published by Puffin and won the 'Books for Younger Children' category of the Red House Children's Book Award 2006. As a follow-up I suggested to Jonathan that we should do 'Pigs Might Swim' with submarines. Jonathan took that all on-board and came up with a swashbuckling piratical yarn...but without the pigs. Without giving too much away at this stage, I can say it's going to feature some of my favourite subject matter and features a pirate submarine, a small dog, a fat cat, a crocodile and a jar of toffee. This project has had several delays and it's been almost two years since I started doing the first sketches and character designs. But now we are back on course and I'm really looking forward to getting stuck into the drawings. 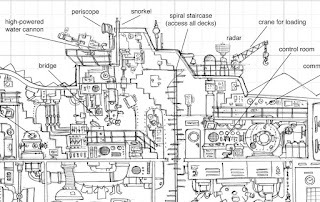 The main 'star' of the book is of course the submarine and I am about to go overboard with detail in a massive fold out cross-section within the book. Again, I can't give too much away but here are a couple of sections from working sketches I've made during the process. Roughs are almost approved and it's almost time to go 'full steam ahead' with the artwork which will keep me pretty busy over the early part of the summer. (That's enough of the nautical puns - Ed). 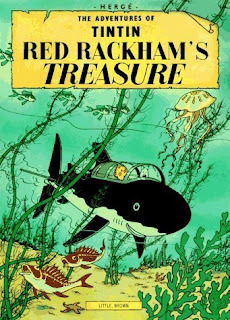 Just time to quickly mention one of my favourite Tin Tin stories by the brilliant Herge, featuring a shark submarine.